An excellent porch or deck railing that is easy to install and hides all fasteners. Price includes all three pieces of the cedar deck railing system: Top Rail, Subrail, and Bottom Rail. Made of premium clear Western Cedar. Use with 1 5/8″ spindles or 2 1/2″ spindles. Can handle up to 2 1/2″ custom spindles/balusters. Also works with Sawn Balusters. Sloped Bottom Rail provides better water drainage which helps prevent rot and is recommended for exterior applications. If ordering sloped bottom rail, remember to specify notched spindles/balusters. Designed to allow installer to completely hide all fasteners. 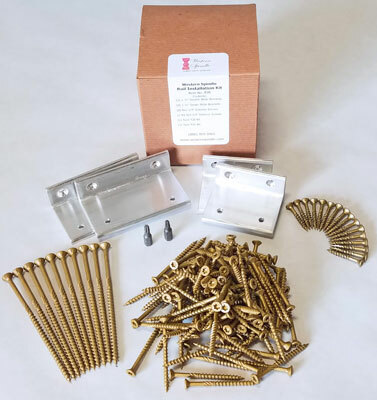 Optional Rail Installation Hardware includes necessary brackets, screws, and bits to attach your rails to a newel, column, or wall. The heart of the install kit is the aluminum angle brackets which fit neatly and discretely under the Subrail and Bottom Rail or Skirt. Makes installation of our Porch Rail Systems a breeze while saving you trips to the hardware store. Order one Kit for every section of rail. This System has been tested and exceeds the load requirements for guard rail when used with our 4″ and 6″ class Porch Rail Systems. Stair rail kit brackets are custom made in our shop to your exact stair angle. YOU MUST SPECIFY THE RISE/RUN OF YOUR STAIRS when ordering a stair rail kit. For hollow columns such as our FRP columns, you may also need to use toggle bolts (not included). A note on longer lengths: Lengths 9′ and over cost more per linear foot because of the additional material and manufacturing costs. We recommend ordering the shortest lengths possible for your project. For example, if you have two 5′ lengths, place them in your shopping cart individually instead of doing one 10′ length. This keeps your product and shipping costs down. Note that longer lengths may be made from spliced wood (don’t worry, the joint is the strong point). Lengths over 11′ feet available upon special request, for an additional charge. Call for details. CURVED RAIL is available. Read This Article and email your measurements to us for an estimate. Our woodwork is stronger and longer lasting than woodwork produced by others. Why? Because we use better materials! Grades used: We use both CLEAR grades of wood in our railing. Should I use the 6″ or the 4″ Rail System? The 6″ class System is used for spindles/balusters from 2 1/4″ to 3 1/2″ wide. The 4″ class System is used for spindles/balusters 2 1/8″ wide or less. What’s the difference between the 4-piece, 3-piece, and 2-piece rail systems? 4-piece System includes, from top to bottom: Top Rail, Subrail, Bottom Rail, and Skirt. Adds 10″ of height with a 3″ toe space. 3-piece System is same as 4-piece, except removes the Skirt. Adds 7″ of height with a 3″ toe space. 2-piece System is same as 4-piece, except removes the Subrail and Skirt. Top and bottom rail only. Adds 6″ of height with a 3″ toe space. Should I use Flat Bottom Rail, or Sloped? The idea behind sloped bottom rail is that the water will more readily shed off the rail, preventing rot at the base of the spindles or balusters. However, we routinely get spindles sent to us for reproduction that have been on homes for 120+ years, and are just now needing replacement because of rot at the base. This is why, if you use the right materials and installation care, we are not afraid to use flat bottom rail outdoors. So while the idea of flat bottom rail doesn’t scare us, the logic of sloped bottom rail shedding water just makes sense. This is why we continue to recommend sloped bottom rail for exterior use. What is the skirt? Should I order it (should I choose the 4-piece Porch Rail System)? A) It adds height to the rail system. The skirt is 3 3/8″ high which means you can use a shorter spindle height. This saves you money on spindles, and often the shorter spindles have a more robust, more authentic look, and are more architecturally “correct”. B) It adds strength to the bottom rail. Because it is a 3 3/8″ high board on edge, it adds considerable stiffness and durability to the system. This makes it stronger, feel more secure when you lean on it for example, and helps keep the porch rail from sagging in the years to come. C) It adds a depth of look, making the rail system look more robust. Not only does it make the spindles look better by allowing them to be shorter, the rail system itself looks more authentic and architecturally correct. Why do you use rails with multiple pieces? For example why use a 4-piece system instead of just a larger top and bottom rail? There are several reasons we use multiple pieces. A) First, it allows you to install the system with no fasteners showing. For example, with a one piece top rail, you’d have to screw the spindles or balusters in place from the top down with an ugly screw head showing on the top of the rail. Or you could install tenons on the ends of the spindles, requiring you to drill holes in the railing and use ugly toe-nailing or messy glue to keep them from spinning. Much cleaner and easier to simply screw them into place from the top of the subrail, then place the handrail on top and screw it in place from the bottom up. B) When no fasteners are showing, that also means that there aren’t any fasteners directly exposed to the weather. When you have a screw through the middle of the top rail, for example, that penatration is a spot where water damage will begin. C) The two part bottom rail used in the 4-piece porch rail system gives the bottom rail a thicker, more robust, stronger bottom rail with a better depth of look. D) Multiple pieces also prevents us from having to use very large, thick timbers from which to mill the rail, keeping the cost of the system much more reasonable. Should I order extra length? We recommend ordering your rail sections a few inches long. For example, if you have a 8′ 6″ section, order a 9′ rail section. This will allow the installer a little “wiggle room” to tie into your newel, post, column, or wall. For what lengths do I need support blocks? We recommend you use a support block for rail sections that are 6′ long or longer. We’ve design our support blocks to be small an unobtrusive. It is simply a 1 3/8″ square block, 4″ high, made of strong and rot resistant Port Orford Cedar. It does the job of supporting your rail system without attracting attention to itself and taking away from the look of the balustrade. How do I install the railing? Detailed installation instructions, with pictures, are included with your purchase, or can be found on our Installation Instructions Page. We offer a Rail Installation Kit that includes all the necessary brackets, screws, and bits required to install one section of railing. We recommend ordering one Rail Installation Kit for each rail section you order. The rail system is designed that so someone with basic carpentry skills should have no problem with the installation. Do I need your Rail Installation Kit, or can I just use my own hardware? Why? Our rail system requires the use of screws and brackets of a very specific size. For example, the best size screw for most of the installation is 2 1/4″, which is a rather uncommon length. Most or all of these items can be found at your local stores if you look hard enough, but we had many customers asking us for a simpler way. So we developed the Kit that includes all the right sizes of screws, brackets, and bits needed for your Rail System installation. And, because we buy the hardware from distributors in very large quantities at wholesale prices, we are able to keep the cost to the customer very reasonable. There is, of course, nothing wrong with buying your own hardward locally, which is why the Kits are offered as an option rather than an included item. Does the Rail Installation Kit work for the stair rail sections? How do I use the square (90 degree) brackets for the angled stair rails? Yes, you can use our 90 degree brackets on your stair rails. Simply bend them, preferably with the help of a vise. Our railing systems are used on exterior stairs all over North America, on homes that are 300 years old, on new construction, by do-it-yourselfers, by large professional construction companies, and on a million different styles of homes. As you can imagine, there are as many of stair slope angles as there are variations of porches. This is why we keep it simple: just bend the brackets to fit your stair slope. It’s that easy! Why are the Railing Systems only offered in Cedar? Cedar is the very best wood for making exterior porch railing. And we make such a large quantity of it in Cedar that there is no cost savings to switch to another wood. It also allows us to further control costs by keeping with just one railing wood to inventory. So, if the cost is the same, why not go with the best wood species? Should I use sloped bottom rail on the stairs/for stair railing? The idea behind the sloped bottom rail is that it sheds water and therefore prevents rot at the base of the spindles. On the stairs, it is not required becuase the rail slopes down anyway. However, we recommend staying consistent with all your bottom rail because it looks better to do so, and there certainly is no harm in using the sloped bottom rail on the stairs. So if you are choosing to use sloped bottom rail on the rest of your porch railing, we recommend you also use it on the stair rails. You will need to cut a compound notch in the bottoms of the spindles on site, which is explained below. How do I notch the bottom of the spindles for a stair railing? You’ll need to cut a compound angle in the bottom of the spindle. This is much easier than it sounds. You’ll need a table saw with a tilting blade and a miter guage to use with slot in the table of the table saw. Simply tilt your table saw blade to 15 degrees. Place your miter guage on the table saw and set it to the same angle as your stair rail. Starting with a scrap piece of the same width as your spindle, cut a “test spindle” and fit it to your rail. It may take 3 or 4 tries to get the angle and length just exactly right, which is why we recommend using scrap pieces first. Bottom Rail: To Slope or Not to Slope?